We have dug through this month’s releases for you and made a selection of the best free themes of July 2018. Responsive Mash is a great theme from WordPress. It’s multipurpose, SEO friendly, responsive, modern, clean, and fully customizable. It’s suitable for those who want to display information and sell products online. It works well with any type of a website such as portfolios, blogs, news page, startups, corporate businesses, online agencies and firms, photo gallery, e-commerce (WooCommerce), and photography. ioCarton is an impressive theme that belongs to ioTheme. It has a framework based on Foundation CSS. It boasts of several features including base on Underscores, Foundation CSS framework, mobile that has specially menu, dashicons which are from WordPress, custom theme name, and text domain. The Underscores and Foundation can be used to update the source. Solid Construction is a good pick for those with construction companies. it offers a framework that can be used for creating modern websites for the architectural companies, building firms, and freelancing architects. Thanks to its features, your website will be impressive on mobile devices and desktop computers. The good news is that it has fast loading speeds, easy-to-use, high-end features, and translation ready. VW Corporate Business is a excited theme convenient for startups and medium-sized businesses. It’s uniquely designed for marketing and promotion of online businesses. It is ideal for corporate business and business websites. It covers various business areas such as architecture, health, design, art, aviation, and e-commerce. For those looking for an SEO and mobile friendly theme, this is the right one for you. This theme is based on Bootstrap and is compatible with WooCommerce. Corporately is another inclusion in the WordPress theme. It’s a responsive finance and business theme that has a simple design. This theme provides many things including using it as a landing page/one page, showcasing your portfolio and app or product. It’s an ideal SEO friendly, free and user-friendly. This theme is great if you want to beat your competitors in search engines. It’s always tricky to get a multipurpose education theme for kids. Kids Education has simplified things as it’s an Educational Theme designed for kindergartens, daycare, primary schools, secondary schools, and high schools. The fine-looking design is ideal for toy stores and any educational activity related to children. Retail is a clean WordPress shopping theme that is compatible with WooCommerce and Wishlist plugins. The notable features include an auto-updating AJAX header cart, a sticky as-to-cart panel that is on single product pages and a horizontal product filter widget area. This theme has raised the bar if you want to increase e-commerce sales. Photozoom is an easy-to-use WordPress theme idea for photographers, painters, artists, and professionals. It can be used for portfolio and personal websites. It ‘s designed to display 3 pages on the homepage and has 2 built-in color styles, light, and dark. The header can be put on the center or split and posts are displayed in a layout of 3 columns. Envo Multipurpose is another fast, and clean responsive WordPress theme. It’s fully widgetized making it easy to manage the content. It’s compatible with several plugins such as WooCommerce, Yoast, and Contact Form 7. It’s a great fit for those looking to create any website including shop, fashion store, portfolio, business agency, and restaurant. Most individuals are worried about getting enough visitors to their websites. Pulito Clean Blog Lite is a WordPress theme designed for blog websites. It’s suitable for mobile phones as it is lightweight and fast. Online eCommerce as the name suggests, is a great theme for shops and e-commerce. This free WooCommerce WordPress theme is suitable for any e-commerce stores. Some of the stores ideal for it include fashion, shoes, jewelry, watch, sport, technology, and mobile. It has impressive features to make the online shopping experience great. It’s fully compatible with popular plugins such as WooCommerce and YITH. Every business should have a blog such as the Magnificent Blog. This is a WordPress theme that will help your customers spend more time on it. It has a modified main banner and comes with different fonts, colors, and background color changes. It’s a great fit for a blog, fashion news portal, and magazine. Along with the widgets, it’s simpler to create many things including as a trending news journal and modern fashion magazine. Goat is a fantastic responsive sports theme that comes in black and white color. It’s customization to help you choose the color that you want. The notable features include a top navigation bar, a social menu, a two column grid layout, and space for a front page header image. The theme has also support for full-width content and video header and logo. It’s compatible with WooCommerce and Jetpack. Get creative with Easy Shop which is a child theme of Easy Store. This elegant theme is fully compatible with popular plugins such as WooCommerce. The design is clean and developer friendly. It’s fully responsive, translation ready and SEO friendly. With several features on offer, it will make your e-commerce website stand out. Mins is a minimal and high-class Primer child theme. It makes everything appear simple and easy to use. Forget about the complex features as this theme is just right for you if you want your visitors to enjoy their experience. We have seen many powerful business WordPress themes, but if you are into business, then Deep Business is worth checking out. This responsive theme offers various features that help you create a business website in just a matter of minutes. This theme has a beautiful design that will make your site stand out. WordPress has continued supporting their customers through Voltbase. This is a starter theme for Volize. It is simple and clean making it simple for your blog. If you’re a passionate blogger and loves what you are doing, make sure to take a look at this theme. Photograph is a marvelous WordPress theme suitable for photographer, blogger, portfolio, photography agency or even photo studio websites. It’s a responsive design so you are assured that it would work on several devices. It’s clean and has great features. Best Minimalist is a WordPress theme designed for professional bloggers and content marketers. It has all the functionality and comes with inbuilt support for Jetpack, Breadcrumb navXT and Related Post With Thumbnail. It’s flexible so you don’t have to worry if the extensions are not installed as you can use the default featured image. My Dog Lite was created to help you make a great looking website for yourself or business. This WordPress theme is specifically designed for different areas including pets, pet shop, veterinary, horse, fisheries, and pet food. It’s also suitable for kids, solar energy, green and clean energy. It has a multipurpose responsive template and can be used with page builders. Online Coach was specifically designed with coaching in mind. This WordPress theme is compacted with features that are ideal for coaches, personal trainers, speakers, and motivators. With so many unique features on offer, it’s simple and easy to use. It’s compatible with plenty of plugins including WooCommerce, Contact Form 7, and SEO plugins. Ryan Business is a great-looking multipurpose professional theme suitable for a business or blog website. This free theme has a responsive layout, HD retina ready and high-class theme options panel. Get this WordPress theme which comes with a full-width slider. It’s compatible with many plugins such as WooCommerce, WPML, and Polylang. It’s a perfect fit for small business, startups, corporate businesses, online agencies, and firms. Page is another fantastic theme of Oneline and is one of the best-looking themes that are available. It’s easy to set up and can be used for business or personal use. It comes with a full customization option to make your website look great. This minimal WordPress theme is aesthetically designed to provide a wonderful looking theme for your site. It has a multi-purpose usage and can be used by a food blog owner, sports blog owner, personal blog owner and travel blog owner. This theme is user-friendly and can be customized as per the requirement. Brimstone is yet again a modern looking a WooCommerce and Blogging WordPress theme. It has a unique design that fits properly as per a the client’s needs. This theme is compatible with all shopping site such as Jetpack, WooCommerce, Gutenberg, and Affiliate WP. I really like the Retail theme among the themes. It is beautiful with minimum options, easy to manage but good support for Woocommerce. Thanks for listing best minimalist in your collection. 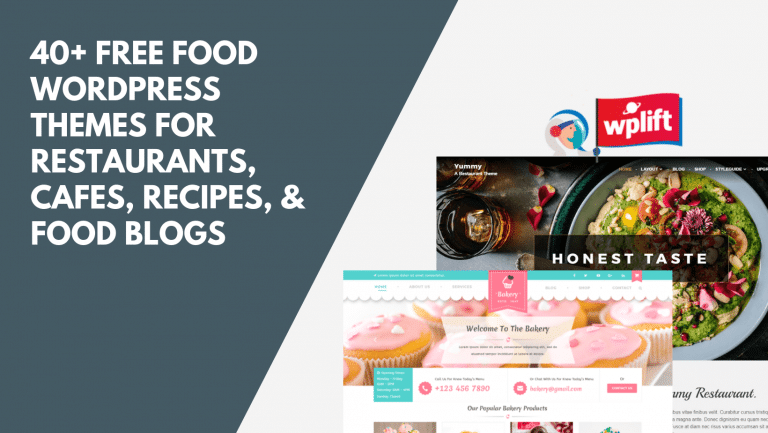 I want to suggest you one more very well designed restaurant based WordPress theme named FoodFork. It has very good design layouts as well as easy to customized blocks. Other great features of this theme are unlimited color schemes, inbuilt shortcodes, custom widgets, Google map integration, food menu, online reservation system etc. VW Corporate Business theme will be perfect choice for my new business.Professional looking.I would love to install this theme on my wordpress site .what about seo? is it seo friendly? How can i customize this theme?.waiting for response from wplift team.I’m looking for a business theme .so,I got it.I would love to thanks wplift team for the gift :) have a good day!